Capsules with nutrients designed to lubricate joints and support a full range of motion Primary Support: Muscle, Bone, & Joint Secondary Support: Antioxidant Healthy joints and muscles require enough lubrication and cushion to move freely and easily. The body uses over 140 different joints to perform an infinite variety of movements. Limb by limb, joints frequently support the equivalent of six times the weight of your body in repetitive cycles of movement, making special care a necessity. In addition, ease of movement is supported by healthy levels of inflammation. 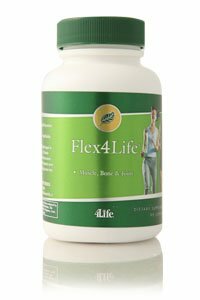 4Life's Flex4Life capsules provide the nutrients the body needs to support joint health, mobility, and flexibility. If you have any questions about this product by 4life, contact us by completing and submitting the form below. If you are looking for a specif part number, please include it with your message.